There are days - you know the ones - when you must make a meal out of nothing. In winter, my go-to is Jen's Linguine with Sardines, Fennel, and Tomato (often with onion instead of fennel, since that's always around). In summer, it's slices of sourdough and perfect tomatoes and some sort of cheese. When it's not that, it's migas or chilaquiles. I really like tomatoes. But still, it's nice to have other options. And last night, while planning Friday night dinner, I came across a Guardian article about making dinner from the pantry. Bookmarked, saved. I had been gushing over yet another round of videos about Turkish cooking, trying to back my way into a decent recipe for Kanafe. Not so simple. Turned out it was much easier to figure out a dinner plan for the evening. I revisited that Guardian piece, saw Fuchsia Dunlop's recipe for spicy sesame noodles, and called it a day. Good Chinese food is all about balancing the hot, sour, salty, and sweet. So why do sesame noodles always get a pass? We load them up with peanut butter until they're gluey and cloying. If we're being honest, here, I find it sort of gross. But thanks to Fuchsia, there is a better way. I'll never make sesame noodles the same again. Dunlop's sauce is a pantry sauce. It's based on peanut butter. But smartly, she has you add a bit of water to the mixture, giving an otherwise clumpy sauce the texture of light cream. 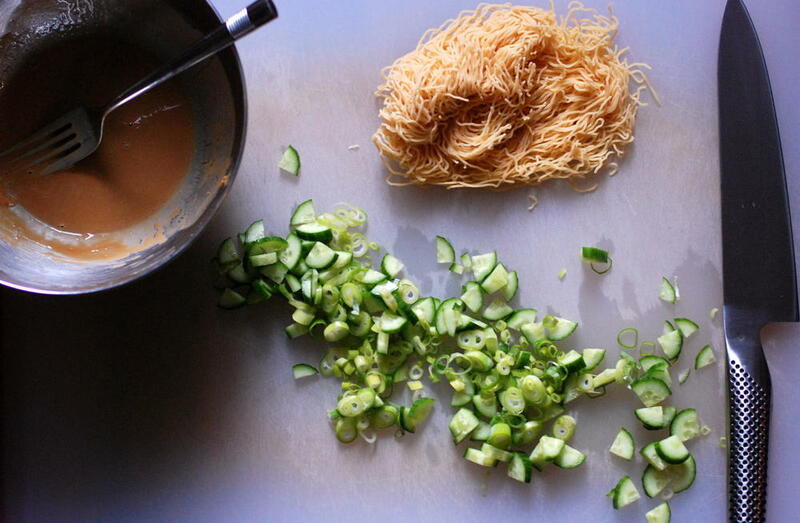 The noodles get slicked and flavored, but never clump. Also likely in your pantry: soy sauce, vinegar. Maybe some sesame oil. A cucumber, a scallion. Maybe some sesame seeds. That's it. If you don't have any of the above, don't sweat it. You need something acidic. Chianking vinegar is best, but red wine vinegar and lime juice both work. I bet lemon juice would work, too. As for the vegetables, Dunlop calls only for scallion, but adding a cucumber makes the experience feel less "crap, instant ramen" and more "wow, I'm a genius." If you have some kale or bok choy or cabbage or carrots red pepper or whatever else, feel free to throw that in, too. And remember, this is pantry dinner: don't worry so much about quantities. We've got four pints of sungold cherry tomatoes on the counter, and I've been munching on them almost maniacally, waiting for regular tomatoes to get good and seconds to hit the markets. August is canning season around here, and while I already pressure-canned 6 pints of salsa (! ), the fun is just beginning. Happy end of July, folks. See you in the dog days. This is a pantry dinner, but still - Fuchsia Dunlop's pantry might look a bit different than yours. I've listed her recommended ingredients first, followed by one or more totally acceptable substitutes. Remember, don't sweat it. Toast the sesame seeds in a small dry pan over medium heat until golden. Set aside. In a mixing bowl, use a fork to mash the peanut butter with the soy sauces (or soy sauce and honey) and vinegar until completely smooth. Stir in the chili and sesame oils and the garlic, and add enough water to make the mixture the consistency of whipping cream. Cook the noodles according to the instructions on the package. If you're serving these noodles cold, as I did, set up an ice bath and use it to shock the noodles as soon as they finish cooking. Drain the noodles. Separate the noodles into 4 bowls. Divide any vegetables you're using among the bowls, and ladle a spoonful of the sauce over each bowl. Top with scallions and sesame seeds. Tell your guests to mix everything well before eating.